- 殘編 (Tanya Hsu) on 八月 11, 2016. La Crema Vinera, which means “best of the vine,” sets the standard for everything the family owned winery (now named La Crema) does since 1979. Taking advantage of California’s exquisite Sonoma Coast’s cool climate, the winery focuses exclusively on cool-climate appellations. Grapes spend more time on the vine in cool climates, which allows flavours and aromas to develop more and deeper, creating rich and layered wines. Year 2014 started with a mild winter followed by a warm spring, which led to an early harvest, and the making of La Crema Sonoma Coast 2014 Chardonnay. Grapes were picked on cool days and at night, followed by gentle pressing and a night of settling. Most of the juice was racked and sent into barrels, with a small bit left in stainless steel for bright fruit freshness. To create the winery’s signature smooth flavours, a secondary malolactic fermentation and sur lie aging was made, including hand-stirring every three to four weeks. The fruits were taken from vineyards across the diverse region, including Fulton, Kelli Ann, Laughlin, Ramal, Saralee’s, and Shiloh, resulting in a beautiful combination of all areas: Fruity and mineral from the south, round and soft from the inland, and bright and citrusy from the extreme coast. It is Sonoma Coast in a bottle. 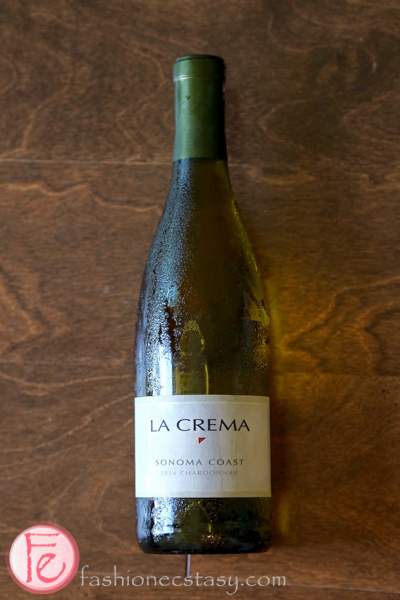 When La Crema Sonoma Coast 2014 Chardonnay was first released in March 2016, it flew off LCBO’s Vintages shelves. Available by consignment through Maria Allan (of Jackson Wines), it will be returning to the market on August 20, 2016, at LCBO. Combine veggies with flowers in a bowl, set aside. Mix all ingredients for vinaigrette, set aside. Prepare a pot of water on stove & bring it to a simmer. Add a splash of apple cider vinegar or white wine and some salt. Swirl water and crack 2 eggs, poach to desired doneness. Place cooked eggs on a plate. Repeat the same process for all eggs. Toss salad with vinaigrette, serve on a plate and top with eggs. Cook angel hair pasta following instructions on the packaging. Heat extra virgin oil in sauté pan over medium-high heat. Add garlic and onion when oil shimmers. Wait 3-4 minutes until onion is almost translucent, then add yellow squash and zucchini. Saute for 5 minutes, until ingredients are almost tender, then season with salt & pepper. Stir in cherry tomatoes, cook for 2 minutes. Toss in tarragon and chives. Leave the heat on for no more than 30 seconds. Serve and top with fresh basil. Use round cookie cutter (or small glass) & cut out round pieces of cake or shortbread. Pour key lime juice into dish. Dip round cakes/shortbread into juice. Place round cakes/shortbread on a platter with dipped side facing up. Whip heavy cream in a bowl of a stand mixer with whisk attachment for about 6 minutes until it firms and forms stiff peaks (or whisk by hand for about 15 minutes). Top with key lime slices and put in freezer for at least 2 hours. (Optional) Dip key lime slices in egg white, then dip in sugar for a glittery presentation. La Crema Sonoma Coast 2014 Chardonnay will be available at LCBO Vintages (#962886) on August 20, 2016, for $29.95.